Once you have removed as much particulate and bio matter from your water, disinfection is the next step.There are many ways to do this. The best method for destroying pathogens is oxidation. 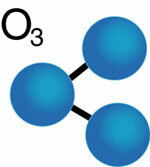 Of all the oxidizers known, ozone is the most powerful available. Other oxidizers are used throughout the horticultural industry. These are often injected at great and recurring costs. Some of these chemicals are phytotoxic and some react with the nutrients in greenhouse water systems to become less effective. Of all the disinfectant tools available, only ozone starts and ends with oxygen. While many disinfectants contain harmful chemicals, ozone breaks down to oxygen, a necessary element for healthy plant growth. In fact, the "waste" from ozonation is higher levels of dissolved oxygen that can be achieved through oxygenation alone. This dissolved oxygen helps keep root zones clean, healthy and pathogen free. DRAMMwater designs and sells proper ozone systems taking into account flow and load. However, unlike other ozone systems, DRAMMwater utilizes a specialized contact tank to ensure the ozone is mixed thoroughly into the water for the best possible result. Click here to learn more about ozone and oxidation reduction potential (ORP). Contact us today to learn more about our water treatment solutions and how we can help fix your water. The oxygen concentrator is the lungs of your ozone system. Make sure that the O2 purity is above 90% to keep things running smoothly. Regularly calibrating your ORP probe will ensure that your ozone system is working accurately. This video discusses calibration and cleaning. DRAMMwater's Al Zylstra explains how and why you need to clean your ozone injector to keep your system in top shape.